Your AC installation offers you a wealth of benefits by making the use of any domestic appliance possible, from microwave oven to hairdryer, DVD player to power tools. A Mastervolt inverter allows you to easily convert the voltage of your 12 V or 24 V battery to 230V/50Hz or 120V/60Hz, so you enjoy all the comforts of home wherever you choose to go. 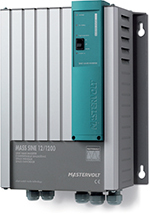 Mastervolt offers a complete range of inverters from 300 watt to 40 kwatt, for 230V/50Hz as well as 120V/60Hz (American voltage). Grid power regularly fluctuates and can cause your lights to flicker. Sometimes it may even drop below 180 volt, causing some devices to stop functioning. The Mastervolt sine wave inverter ensures a perfect AC voltage, and makes power problems a thing of the past. The pure sine wave technology also helps protect your equipment against failures, humming or interference on monitors or TV’s and ensures a longer lifespan. 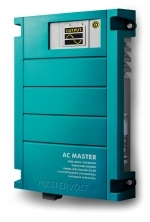 Which Mastervolt sine wave inverter fits your needs? This model is intended for professional applications with high power demands, and extends the Mass Sine series. 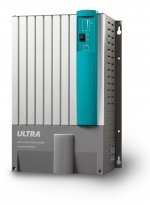 With 4 kW AC power, the Mass Sine Ultra meets the highest energy requirements. Latest technology increases the efficiency and enables multiple units to work in parallel and 3-phase configuration. These high quality sine wave inverters have proven themselves in the most extreme conditions for over twenty-five years. Although the dimensions and connections of the various models have remained the same, the technology has evolved, resulting in a fast, efficient, one-on-one replacement with minimal downtime. These affordable sine wave inverters convert 12 or 24 V battery voltage into reliable grid power, making it ideal for recreational and semiprofessional applications.